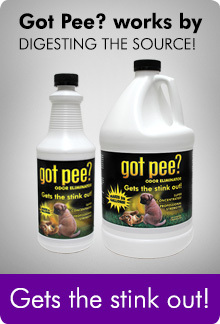 Got Pee? Odor Eliminator permanently eliminates unpleasant odors from urine, vomit, feces, garbage, skunk spray, smoke and many other organic sources. Got Pee? has a specially bred bacterial enzyme that attacks and breaks down organic matter by digesting the source. Got Pee? helps prevent dogs and cats from remarking their territory. 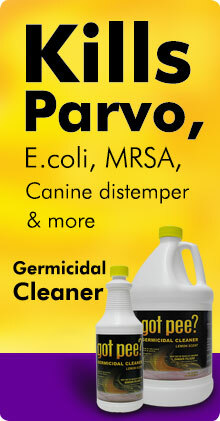 Safe and effective on carpet, upholstery, clothing, gravel, grass, dirt, pet bedding, sinks, drains and garbage pails. Got Pee? GETS THE STINK OUT GUARANTEED!!! 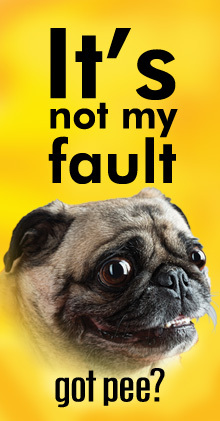 Don't worry - eliminate those little or BIG mistakes your pet might make.